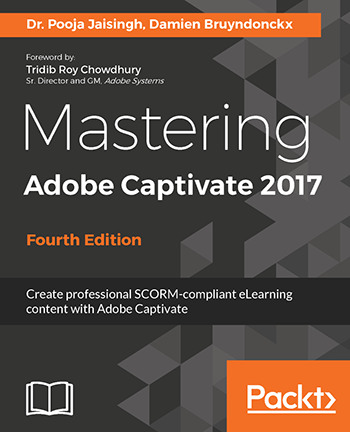 If you are new to Adobe Captivate or starting to work with Responsive Projects, the book Mastering Adobe Captivate 2017 by Damien Bruyndonckx and Dr. Pooja Jaisingh, is a great resource. The book covers all basic operations in Adobe Captivate so you will get a solid understanding of how to work with all the different objects in Adobe Captivate. It also covers the more advanced features such as variables and advanced actions, so you can create some great advanced eLearning modules. Finally the book covers how to work with the responsive features in Adobe Captivate 2017, which will save you countless hours when you are developing responsive content. Damien is an Adobe Certified Instructor and has extensible knowledge about Adobe Captivate. He has also written several books about earlier versions of Adobe Captivate. Dr. Pooja Jaisingh works as a senior learning evangalist at Abode and chances are that you already know her from her many tutorials about Adobe Captivate and eLearning in general. The fact that Damien and Pooja has teamed up to write this book together, means that you will be in very good company. Note: I do not receive any commission, kickback or other incentives for writing this post. This is purely posted as I honestly think this book will help people better understand Adobe Captivate.